We are joining a one day event at the Universitat Oberta de Calalunya on Oct 3rd. “This event will address the challenges that current higher education models face and showcase innovative initiatives and practices that offer creative answers for pressing issues that can lead the way towards new educational futures.” Find out more on their website. 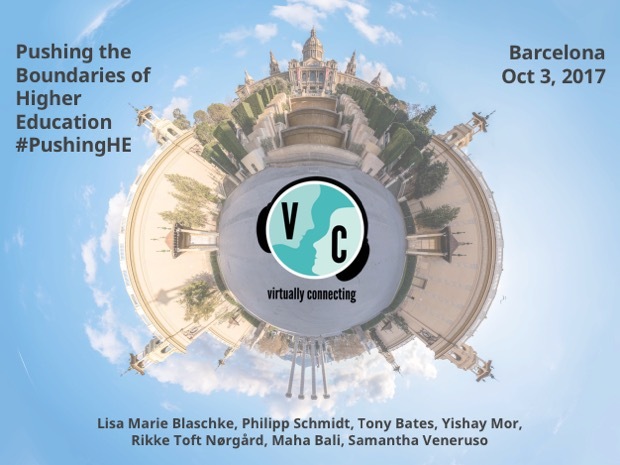 We have one very special Virtually Connecting session planned: Philipp Schmidt, Tony Bates, Lisa Marie Blaschke, Yishay Mor and Rikke Toft Nørgård will drop by and share their views on the challenges higher education faces, but also on the opportunities and visions of higher education mapped out at the event. (added later: we will also have Allison Littlejohn, Brian Lamb on schedule and Jim Groom may drop by). Onsite guests and virtual participants will be in the capable hands of Virtual Buddy Maha Bali. Mitchell Peters will make this session possible as our Onsite Buddy. Please note that we are connecting with a live event that runs on a schedule itself. We therefore might start a bit early or run a little late. Please also consider that some of our onsite guests might have to join late or leave early. If you would like to sign up for this session, leave a comment here under the post or tweet @VConnecting. Also, please let us know if you would like to join all of the session or only one or two sections. Header Image by Tristan Schmurr via Flickr under a CC-BY 2.0 License, modifications by Christian Friedrich under a CC-BY 4.0 license.